Following up on a plea for help from a reader whose Corgi was engaging in excessive barking, this article addresses how and who to utilize when trying to cope with an unwanted behavior. Let’s start with trainers. When do you need one? Why do you need one? What style of dog training do you want to use when working with your dog? 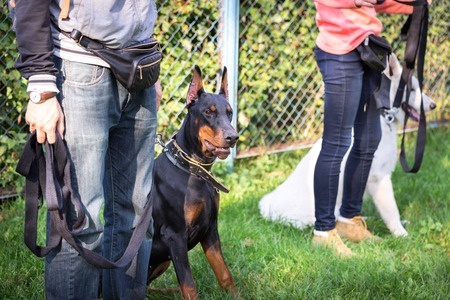 These are questions that you want to explore prior to signing up for an obedience class. When do you need a class? Any age is appropriate and the younger, the better. Adoption and foster dogs are prime candidates at any age for attending since the working relationship between the owner and the dog strengthens the bond you are forming with your new pet. One on one time establishes your love, your bond and your dog’s confidence in you as the loving, benevolent leader of your pack. Why do you need a dog training class? Because your dog is neither a person nor a mind reader. We cannot expect our dogs to behave like humans or be the ones in charge in a dodgy situation. They know how to handle other canines. They do not know how to navigate the human world, which is unfortunately where they live. They do not live in packs in the wilderness, like their ancestors do. They live with families, in cities, in the mountains surrounded by wildlife, in condos, HOA’s, assisted living facilities. In other words, they live in a world that is familiar to us and is full of potential pitfalls for them. What trips a dog’s trigger is very different from what gets your 15-year-old son’s attention long enough to get him to put away his Xbox. Positive reinforcement focuses on working with your dog by tapping into what interests him. Why positive reinforcement training? Bluntly put, in the last 50 years we’ve made huge technological advances. We’ve sent satellites into space, heated our homes with wind and solar, cured a multitude of diseases. Simultaneously, we have made advances in understanding and training dogs. The methods used in the 1970s’ are outdated, unnecessarily punishing and based in fear and negative reinforcement. Collar pops and pulls, metal training or slip collars, dogs being physically forced into a position or anger toned verbal corrections are all punishment based methods that are used in traditional training. Positive reinforcement training is based on rewarding behavior you approve of and modifying behavior you do not like. If it’s unwanted behavior, you learn to starve it instead of feeding it. Dogs are not cats. Bad attention is just as rewarding to them as good attention. You walk in the door after a long day at work and your dog comes up and sits, tail wagging, delighted to see you. You don’t notice because you are wrangling two kids, the groceries and trying to find out if your husband is home. The dog quickly learns that sitting quietly gets him nowhere. So, what alternative should he use to get your attention? Jumping on you works, right? When he nearly knocks you over in your kitchen, you notice him then, right? When he counter-surfs and tries to steal the food you are unloading, I bet you remember his name (and a few other not so choice names) then. Right? Dogs aren’t dummies. If one way doesn’t work, they find another. Bad manners evolve primarily from neglecting to notice and acknowledge good behavior. So where does an animal behaviorist come in? Often a behaviorist and a positive reinforcement trainer overlap one another because they use similar methods to modify unwanted behaviors. The longer a dog engages in bad manners (barking, jumping, lunging on leash), the more ingrained and reinforced that behavior becomes. It is no longer a random act or annoying quirk; instead, it has become a learned behavior that basic obedience dog training can no longer address. 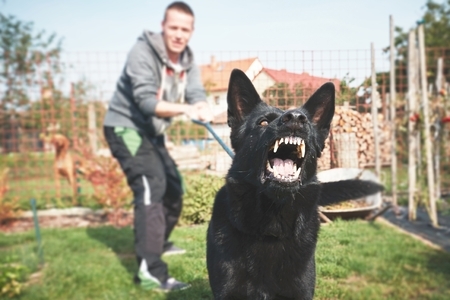 If you can’t control your pet after proper dog training, an animal behaviorist may be needed. Behaviorists work with many issues: barking, separation anxiety, potty training, dog or human fear aggression, and what my behaviorist, Lori Holmberg, describes as “adjustment difficulties” when introducing a new pet or a new person into the family. Lori is the founder of Animal Expressions, LLC ; she is my go-to person when I realize I’m in over my head. When it’s clear that what you’re doing to modify a behavior is not yielding results, it’s time to call in someone who can. One sure sign that you need a behaviorist and not a trainer is if the behavior continues or worsens. Separation anxiety, fear aggression towards humans or other dogs, uncontrollable barking, excessive jumping or running away are not behaviors that magically improve on their own. They must be addressed with a program that focuses on modifying them. Dogs are individuals so different methods work for different dogs. A modification program can be developed by your behaviorist based on your dog’s breed, background history, personality and specific likes and dislikes, fears and phobias. The only resistance I have ever had from some clients I’ve referred to a behaviorist has been over the cost. Yes, you are going to spend money (and time) to help your dog work through her fear of men, his aggression with other dogs, her anxiety over being left alone, his out of control barking that is driving you and your neighbors crazy. The longer you procrastinate in addressing the problem, the worse the problem becomes. Worst case scenario is you will end up passing on your problem to someone else by relinquishing your dog for adoption where he will become someone else’s problem and may end up being euthanized. Your dog is a member of your family and is going to require a lifetime of healthy, natural foods, exercise, socialization with humans and other dogs, annual checkups, training, possible surgeries, etc. In other words, just like any member of your family, your dog is a lifetime investment of both your time and dime. Decide what you and your dog need and commit to making it happen. Rome wasn’t built in a day; your dog’s behavior or bad manners did not develop overnight either. Time, patience and a willingness to see the process through will give both you and your dog a healthy, loving relationship with endless benefits. Yep, seeking professional help can really transform a bad situation. After attending a dog training class for the very first time, I realized just how little I knew about training dogs (and I thought I knew a lot!). I also realized that it’s the human that needs most of the training. Once the human knows how to behave and what “buttons” to press, the dog will not be a problem for long. I’ve never owned a dog however have had cats. Not that it’s the same however I can definitely say that consistency and patience is key in training. It can work. If you need to get assistance definitely a good idea. Sometimes it’s a matter of finding what training techniques works well with your pets personality too. What works well with one pet may not work well with the other. I very good point! Just like with anything we do for our pets, it’s a good idea to shop around a bit and ask questions in order to find the right trainer and the right technique for training your dog. This is a great topic! I am of course a fan of positive reinforcement training, but have a friend who takes more aggressive dogs for training where of course positive training does not work. I wish more people would spend the time to get quality training for their pets – given how many are relinquished for easily fixable issues. Some really good points here! Great insight and I’m glad you pointed out that often clients can hesitate at the cost. I’m a big believer that an ounce of prevention is worth more than anything. If what you are doing isn’t working, get professional help. The behavior will only get worse if it is not addressed properly. Thanks Heather! I know that the author, Linda Wagner, is a firm proponent of proper training and using a behaviorist when it’s warranted. Like you, I believe these to things could dramatically reduce the number of good dogs found in shelters. Even though I have been a pet pro all of my life and have shown my dogs, I know the value of enrolling in obedience classes to socialize and proof a dog’s behavior. This atmosphere also builds a dog’s confidence. Aggressive dogs can also be effectively trained using positive reinforcement when the trainer has enough experience to deal with the total picture. Roman Gottfried is an internationally known holistic trainer that tackles the tough dogs with love, not force. Excellent article. Wonderful post! I like how you discussed the difference between when you need a trainer and when you need to call in a behaviorist. Great information here. Thank you for sharing! Positive training and behavior training are all about humans trying to understand and communicate with their dogs. The communication has to be both ways — b/c goodness we dogs make a lot of effort to communicate with humans! I didn’t realize there was a difference between a trainer and animal behaviorist. I think my dogs (and I) would benefit from a good dog trainer. Professional help is the best way to go, thank you for detailing the different kinds of help and situations when it is appropriate to seek help for a dog with behavior issues. Best for both dog and his/her human family. It is so great to get professional help but it can become extremely expensive. I have an anxious reactive Pug. We have tried to use behaviourists and expert trainers but not viable more than a few times. Plus the implementation of programs is time-consuming and it always takes way longer than expected. I think you make a valid point and I tried to emphasize that in the article, too. Behavioral modification takes time, it takes money and an owner has to have reasonable expectations about how much work and time it will take to modify an ingrained behavior. I think many owners are often taken by surprise at the amount of work it takes and the amount of time you have to invest. All things to take into consideration when looking for a behaviorist as well as your budget. I love going to dog training classes. For one thing, it gets you to practice and to do the work of actually training your dog. I had dogs all my life and when I got my first dog as an adult, I thought I knew how to train it, but the classes taught me so much more – well worth the time and effort. I took Rufus to an obedience school before going to a behaviorist. The school only taught basic commands. They did see that he had a barking issue, but didn’t say they weren’t the school for him until after I’d paid $200 and took 2 classes. Hmm. That was an unfortunate experience! We’ll be doing another article soon on how to pick the right dog trainer and behaviorist for your pet, so stay tuned! Training is so important. I have met some fantastic trainers too. Did not have a very impressive experience with a behaviorist, though. I’m sorry to hear that you didn’t have a good experience with a behaviorist. Sometimes it comes down to a good fit in terms of personality and temperament (for both the person and the pet!). I would encourage you to try with another behaviorist to see if it was dissatisfaction with just that person. A good behaviorist can work wonders!